This type of hearing loss accounts for about 90% of all hearing losses and occurs when there is damage to the inner ear (cochlea), or to the nerve pathways from the inner ear to the brain. The most common causes are aging and exposure to loud noise. In most instances, sensorineural hearing loss cannot be medically or surgically corrected. Hearing aids however, can be beneficial for this type of hearing loss. 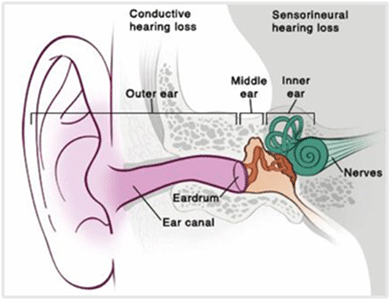 Hearing loss that is identified in the outer or middle ear is Conductive Hearing Loss. With this condition, sound cannot be conducted efficiently through the outer ear canal to the eardrum and the tiny bones (ossicles) of the middle ear. This results in a reduction in sound level or the ability to hear faint sounds. Conductive Hearing Loss is often temporary or medically treatable. Mixed hearing loss involves a combination of any of the above-mentioned types of hearing losses and disorders. In most cases mixed hearing loss can be successfully treated with the appropriate hearing aids. This type of hearing loss occurs beyond the cochlear (inner ear), either along the 8th cranial nerve (auditory nerve), areas of the brain that process speech, or other areas of the central auditory system. To determine if a retrocochlear pathology is suspected, additional medical tests are recommended.